Who knew that raiding your grandmother's closet would make you one hell of a trend-setting, vintage fashionista? You wouldn’t expect your grandmother to be a style inspiration for many girls who are almost three times younger than her. But ‘Granny chic’, as it is called, is making its way onto the high street and is also becoming a trend among celebrities. This rather peculiar fashion style is being glamourised thanks to fashion ‘IT’ girl Alexa Chung and London fashion bad boy Henry Holland, whose latest Autumn/Winter 2012 collection for House of Holland was inspired by granny chic. Girls have often opted for vintage clothing, as it has become one of the most popular choices over the years. The vintage style is not about looking old but using pieces from your mother’s wardrobe and giving them a youthful twist. But now we’ve gone one step further by entering granny territory. ALEXA CHUNG WORKING THE GRANNY CHIC EFFORTLESSLY ON THE STREETS. 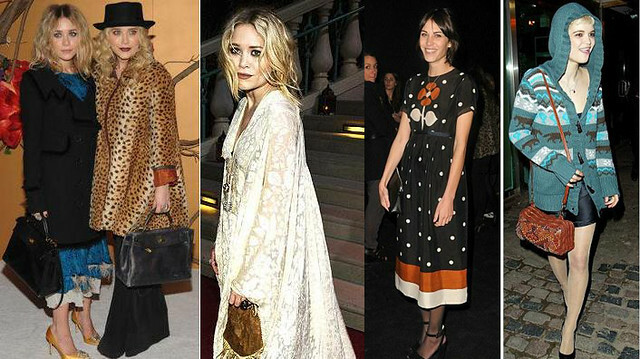 CELEBS LIKE THE OLSEN SISTERS (FAR LEFT) ARE ALSO SHOWING OFF THEIR GRANNY CHIC STYLE. HOUSE OF HOLLAND'S CROCHET-INSPIRED COLLECTION GIVES THE GRANNY CHIC STYLE A LITTLE HUMOUR AND FUN. So what exactly is granny chic? It is all about heavy and frumpy cardigans, tweed mid-length skirts, flesh-coloured tights and mid length dresses with vintage prints. Just go raid your grandmother’s closet and you would know what I am talking about. Take style pointers from granny chic extraordinaire and fashion blogger, Tavi Gevinson, who is only 15 years old but dresses like an 80-year-old. With her chunky knitwear, over-the-top vintage accessories and sometimes very strange vintage pieces, Tavi epitomises ‘granny chic’ and even brings it to a whole new level. Check her out at thestylerookie.com. YOUNG TAVI IS AN EXPERT IN MAKING GRANNY CHIC LOOK SO DARN GOOD. To put together a granny chic outfit, choose pastel coloured clothing, and do loads of chunky layering with knitwear and crochet. Add a few vintage pieces, such as belts and stockings, and comfortable flat shoes to complete the look. You can give it an extra oomph with a pair of granny glasses and nicely curled hair too. Also, try playing around with vintage 70s and 80s prints. Just remember, you may look like a twisted high street granny but don’t act like one, and don’t go over board by dyeing your hair grey. The important thing is to be natural.